Breman Installation Technology is an expert regarding sustainable and energy saving solutions. They foresee a great future in chain management, installation and maintenance using RFID tags. These wireless sensors without the need for batteries are able to receive data and communicate. They can be deployed in the visualization of data and models in AR. 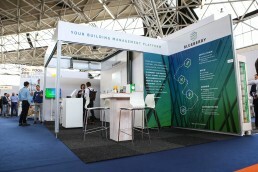 During Building Holland, an event in the RAI, they wanted to show the future of RFID in construction with an AR presentation. "The possibilities regarding data visualization are unlimited"
The measurements of the Breman sensors can be read out at a distance and will send out an alert when the indicators fall above or below the predefined range. We have developed various AR components that can visualize data in real time. For instance the CO2 content of a room or the temperature of a boiler unit. The marker can be scanned at the location, after which the visualizations of the results will appear immediately. The smart sensor is able to detect a gas leak automatically, subsequently an alarm center will notified. Using the AR application the source of the problem can be read out directly, and the CO2 levels in the building can be checked. The AR application is also used to find and assemble parts of a machine to name an example. The sensor knows exactly where the problem is located. Subsequently the AR application will show exactly where. Because the AR presentation at the event proved to be such a great success, a second project was commissioned at the spot.